Tasmania, Australia---the world's most isolated island. It is rumored that, deep within the wilderness, an ancient species known as the Tasmanian Tiger is alive and breeding. Yet, modern science refuses to believe such a creature now exists, since no witnesses have ever been able to prove it. That is, until zoology student Nina (Mirrah Foulkes), claims she can breach Tasmania's impenetrable forests and confirm the tigers' existence. Driving Nina's quest is one critical piece of proof: a photo of a paw print taken by her sister just before she met with a fatal accident eight years before. But what Nina doesn't know is that, in the early 19th century, the murderous convict Alexander Pearce (aka "The Pieman") had broken out of prison twice, and each time he had killed and eaten his fellow escapees. Pearce was hung for cannibalism in 1824, but not before he'd spawned a blood line who inherited his taste for human flesh. Soon, Nina and her friends discover that in the wild, as one species may have died out, another has thrived---in the form of the Pieman's descendants. 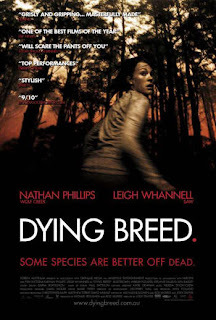 When she sets out with her partner, Matt (Leigh Whannell), his old mate, Jack (Nathan Phillips), and his girlfriend, Rebecca (Melanie Vallejo), their little expedition encounters the island's reigning breed, but one who stands on two legs, not four. The Pieman clan has survived, and their need to feed and breed turns Nina, Matt, Jack and Rebecca into this island's next endangered species.